SR-VOC is one of more than 5,000 organizations on LibraryThing. The Lodges of Southwest Missouri, volumeXXXXVIII by Ronald E. (editor) Wood Jr.
About meWhereas a Masonic Lodge appears in almost every community in the United States, Scottish Rite units tend to be regional and are called "Valleys." The Valley of Chicago covers the northeastern area of Illinois. A Scottish Rite valley confers degrees numbered 4 through 32. A Scottish Rite degree can offer a new reflection each time it is performed or observed. The lessons are taught through parables in the form of plays, allowing Masons the opportunity to bond through theater, stage work, costuming, makeup, set design and musical activities. Cast members present the lessons, which are taken from Biblical and modern historical events, to candidates who learn from observing the performances. About my libraryThis library has a significant collection of books on Freemasonry, especially related to the State of Illinois. It is strictly a reference library with no books loaned out. The collection was started more than 100 years ago and new works are periodically added. 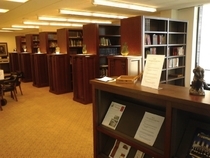 As with many Masonic libraries, this one shelves its books according to the Boyden system. The call numbers are proceeded with an M for Masonic. This permits an efficient breakdown of subjects for the thousands of books in a narrow field that would otherwise all have the same Dewey number.